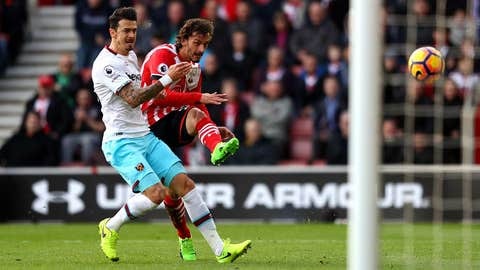 SOUTHAMPTON, England (AP) — Defender Jose Fonte made a winning return to St. Mary's stadium as West Ham rallied from a goal down to beat Southampton 3-1 in the Premier League on Saturday. Fonte joined West Ham in the January transfer window and the center-back's departure, along with an injury to Virgil van Dijk, left the hosts with weaknesses in defense. The Saints did score first through new signing Manolo Gabbiadini, who joined on transfer deadline day from Napoli. Gabbiadini smashed the ball home off the underside of the bar in the 12th minute but Southampton's lead lasted only two minutes. Andy Carroll equalized with his fourth goal in four games after the big front man was sent clear. Pedro Obiang beat Fraser Forster with a deflected strike from 30 meters (yards) — his first league goal for West Ham — to put the visitors ahead just before halftime. Mark Noble's 52nd-minute free kick gave the Hammers a two-goal cushion.